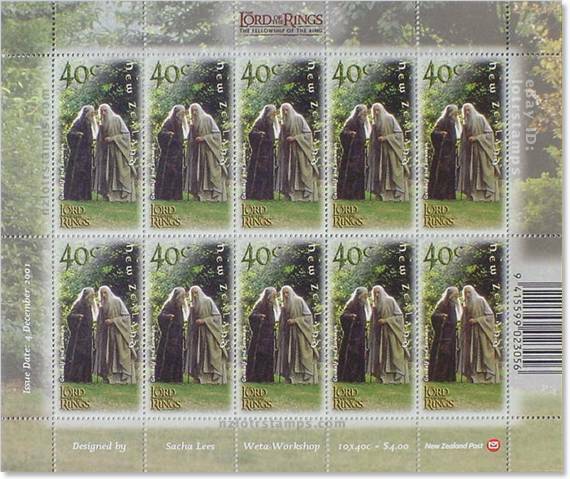 Special authorized New Zealand sheetlet of ten identical 40c stamps featuring different border design issued to commemorate director Peter Jackson’s award-winning movie vision of JRR Tolkien’s The Lord of the Rings trilogy. Unique Fellowship of Ring stamp collectible as no other sheetlets were issued for the subsequent two films. 2001 Gandalf Sheetlet is also included in Fellowship Ultimate Collection and Full Set containing one of every item produced. EACH STAMP ISSUE includes a different stamp design featuring key characters and scenes from the award winning The Fellowship of the Ring, The Two Towers, and The Return of the King movies. Note that the decorative border (known as a selvedge) differs from that of the regular Fellowship stamp sheets. These superb Official Sheetlets were only issued and marketed in New Zealand to mark this seven year-long, US $270 million production, and were designed by Sacha Lees at Weta Workshop. Fellowship Sheetlet: This 40 cent sheetlet is one of the 4 December 2001 issue commemorating The Fellowship of the Ring. It was only marketed in New Zealand to honour Peter Jackson’s The Lord of the Ring and was available for a short time at retail postal outlets. Forty cents (40c) was the standard domestic letter rate in New Zealand. 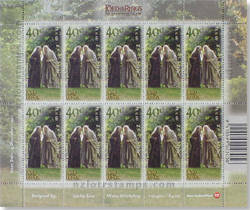 No sheetlets were issued for The Two Towers or The Return of the King making this a unique item in the New Zealand Post The Lord of the Ring stamps issues. All images, logos and trademarks are the property of their respective owners. Portions of the HTML code, images and text contained herein this webpage are copyright 1999, 2001 - 2018 Agitprop Associates and are protected under United States and International copyright laws, conventions and agreements. All rights reserved. This website is not affiliated with New Zealand Post, Weta Workshop, or any other organization herein mentioned.